I heard a great phrase on an Australian politics podcast recently where someone said ‘had we reached peak unravelling for this government?’. I wonder have we seen that with our own government? Or is it a case of further serious trouble ahead or a slow decline as we roll towards the election? Killing the story is apparently the name of the game this afternoon and evening with the news that John McNulty has withdrawn from the Seanad by-election and with the resignation of Hilary Quinlan from the board of Irish Water. A shame the appropriateness or otherwise of a board member of a semi-state utility working with a Minister of State wasn’t seen as a problem from the off. A most illuminating insight in the space of a week – and no wonder they did resign given that the McNulty story had traction across and over a week and was given added impetus by the latest revelations – into the attitudes of our government party to matters of administration. By the way, I’m a bit surprised at how many have spoken of this beyond those of us involved, active or interested in politics. Just in passing – perhaps, but it does seem to have impinged on the broader consciousness. That can’t be good for FG. A most telling piece in the SBP this weekend about the Irish Fiscal Advisory Council and how its chair, John McHale has suggested that “If I found I wasn’t having an effect, I would consider my position.” The SBP itself notes that in the four years since the establishment of IFAC its recommendation has been implemented once and in three other instances the government has taken a somewhat different line. It’s also worth noting that IFAC has been resolutely conservative in its advice, seeking greater ‘fiscal discipline’ at all times. …members of the council admit that the government will hit the official deficit target of 3 per cent of GDP with a neutral budget, last week they warned that “compliance with the official targets does not mean that the overriding task of repairing the public finances has been accomplished”. Which makes me wonder whether its not the very idea that IFAC’s advice has to be taken for it to be functioning properly. Advice, after all, is not proscriptive. And IFAC’s view is a very specific one which need not – by dint of its nature – take into account other factors, such as whether politically as well as economically a measure is implementable. In an interview with The Sunday Business Post, McHale outlined his concerns about pressures distracting the government from making the necessary adjustments. But again, there’s been no real relaxation. IFAC wants more, but it cannot deny that the framework already established is being adhered to. And that I think points up a key aspect of this. If the government were to deviate from the official targets then it seems reasonable to suggest that were IFAC to issue a warning over same it would be entirely valid – in the context of the orthodoxy. That, in a sense, is when its core purpose as a ‘watchdog’ comes into operation. But for the government to keep to the 3 per cent target even if IFAC advises more is not, as such, problematic. But in case all this sounds like an apologia for the status quo let me be clear. IFAC seems to me to be of one mind in pushing the dial in a certain direction, that is more rather than less ‘austerity’ and its public pronouncements are of a piece with this. That in itself can serve a useful function by keeping the terrain upon which the debate is shaped tilting in a certain way. And that – whatever the nature of IFAC itself or its stated goals – serves a purpose. As mentioned earlier in the week, there’s a profile in the Phoenix of Paul Murphy. But as I saw that advertised on the front cover when I purchased it I realised that it would more than likely be an overview of the SP. And imagine my lack of surprise when on reading the piece it turned out to be an overview of the SP, the SWP and so on – though with a curious drive through of SF’s candidate strategy in Dublin South-West, that latter due to the somewhat tenuous linkage that Murphy will run as the SP candidate at the Dublin South-West by-election. The Phoenix argues that since DSW is about to go up from four to five seats it’s the GE that he and the SP are looking for as they seek to retain two seats for the SP in the Dáil with the imminent retirement from that institution by Joe Higgins. It notes that back in the early days of the ULA things were happier, at least on the surface. 2011 saw five TDs, Higgins, Daly, Boyd Barrett, Joan Collins and Seamus Healy elected broadly speaking under that banner, though in actual fact they were elected under their individual party designations i.e. SP, PBP, etc. As we know, the ULA disintegrated in the subsequent two or so years, with consequent, and in some instances, understandable frustration and upset on the part of many involved. And since then we’ve seen some depressing examples of political manoeuvring – most notably at the European Elections where the prospects for retention of a further left seat faded when both the SP and PBP contested it. The Phoenix argues that in relation to that: ‘Smith’s real goal is a Dáil seat in Dublin South-Central in the knowledge that this is only attainable by replacing ‘Comrade’ Collins’. The Phoenix suggests that ‘despite modest gains in the local elections, the prospects for growth for both the far-left groups is bleak, and in fact they may struggle to hold on to any of their Dáil seats’. It is true that the locals didn’t bring massive breakthroughs, but, in truth both did build on pre-existing numbers of councillors in their respective alliances – AAA and PBP. 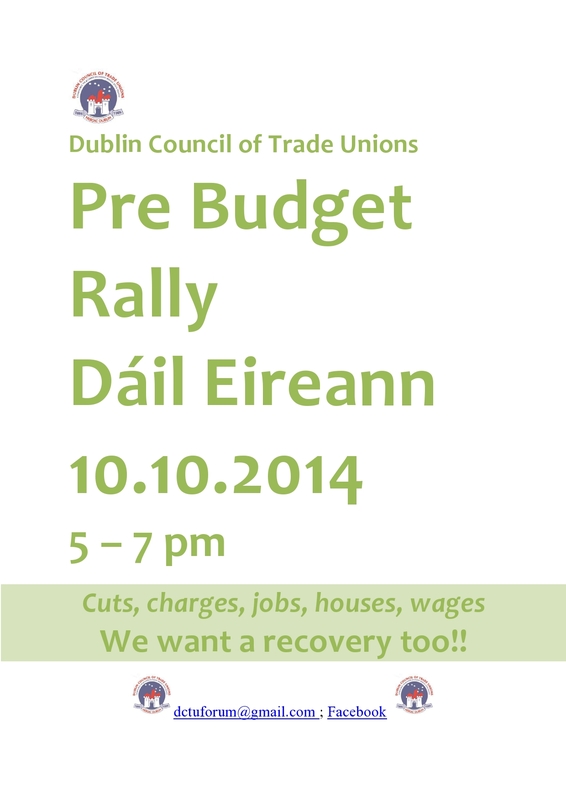 One could argue that those will provide a core of activity around which Dáil campaigns can be supported. And, as or more importantly, vice versa. In any event the Phoenix lists the constituencies. It’s all pessimism about Dun Laoghaire, which surprised me, but it makes a very solid point – ‘two of RBB’s comrades won council seats but with only a combined total of just over half what the TD secured in 2009’ and that in addition to the fact that due to the Ceann Comhairle being returned unelected the constituency will effectively drop to a three seater. The Phoenix thinks FF and FG will take a seat each leaving the rest to FG, the LP or RBB. Dublin Mid-West (sic), well it argues that there are only two seats up for grabs after FG and FF, with SF, LP and the SP fighting for them. I’d think the LP might be the loser here, but it is Burton so that could alter things. SF is solidly in contention. But there’s a strong legacy from Higgins and I’m unconvinced that in any event, legacy or not, Coppinger won’t take the seat on her own strengths. Dublin South-Central is a mess. Collins should on the face of it win. But Smith’s presence throws predictions, and SF is in contention too for a second seat (the Phoenix notes that Daithí Doolan did particularly well). The Phoenix puts forward the case that in a way only Collins and Daly seem more rather than less likely to be re-elected, and it suggests rather tenuously that it is because they slipped the ‘straitjacket’ of ‘narrowly ideological parties’. Perhaps so. Perhaps so. But it seems to me that it’s more likely that specific circumstance in constituencies is shaping this contest. RBB is unfortunate that it’s the Ceann Comhairle. Collins unlucky that her erstwhile comrades would be so provocative. It’s far too soon to write off Coppinger. It is true that other seats around the country don’t seem to herald any great breakthrough. But while I think there will be losses from the original five I think on a good day it might just be one or two. So not quite the wipe-out of the further left that the Phoenix would seem to make out. Indeed there’s a sense that perhaps that argument is overdone. I doubt anyone at this point expects runaway electoral and/or other success any time soon, perhaps not for decades, perhaps never. But matters staying more or less the same is far from matters going into reverse. Referencing Adrian Kavanagh’s projections, while they’re obviously broad brush stroke they seem to point to holds, if not quite gains, for many or most further left TDs in the Dáil. So, ironically, it’s more a question of much the same as 2011: UL 2, PBP 1, SP 1, and WUAG 1. All that has happened has been a repositioning within that original 5. And of course this is only one projection and only based on the current situation. In fairness the profile is quite complimentary to Murphy, noting his hard work on the ground and in Europe over the years. But there’s a lot of questionable stuff. Is Murphy being groomed to be the public face of the SP? Does that even make sense in the context of the sort of party the SP is? Are the SP’s and the SWP’s attitude to the North really so similar? Is the latter ‘effectively abstentionist on the national question and hostile to Irish nationalism’? I think it probably is true that SF will roll forward yet again, picking up seats here and there that were entirely unexpected, and in a way that may be deeply problematic to the further left blocking gains here and there. There’s also the point that the demise of the ULA was a profoundly demoralising experience with ramifications that are still reverberating around the left to this day. And there’s the clear problem of having similar organisations contesting much the same electoral ground, or in some instances, as noted above exactly the same electoral ground. In a way, though, surely another way of looking at it is that the further left has planted a flag on electoral terrain, taken and is in the process of holding seats. This despite all the problems that the Phoenix has listed, and one or two it hasn’t! In other words, despite everything the further left party least likely to return a TD next time out is not the SP, but the SWP/PBP. That most or all of the other TDs elected in 2011 will be returned. There’s an outside chance of one or two more. Sure, not exactly a ringing endorsement and unlikely to alter the overall balance of power in the next Dáil or all that much outside it if economic conditions continue to strengthen, but not entirely discreditable. Actually a much more interesting question presents itself, and that is what, if anything, can be done with these resources, that likely 5 TDs and those three groups/parties, in relation to a broader consolidation of the Irish left. The Minister of State at the Department of the Environment has hired a director of Irish Water – the semi-State company his department oversees – as his personal driver, The Irish Times has learned. Posted by Aonrud ⚘ in Irish Left Online Document Archive. As posted here previously, there’s a timeline of Irish Left organisations taking shape on the Irish Left Archive site. Thanks to everyone who commented with additions and corrections, and in particular to John Goodwillie, on whose work in Gralton the initial timeline was based, and who also provided a number of corrections. Since it was posted there have been a couple of dozen additions, and numerous corrections, so the feedback has been very helpful. It should already be a lot more accurate and comprehensive than where it started. It’s also getting inevitably larger, so I’ve added a search feature that should make it easier to find an organisation from among the mass of links, and also to spot any that are missing. There remain some groups which have been hard to pin down, including some already represented in the archive, which hopefully some readers will be able to assist with, and no doubt others that I haven’t come across. You’ll notice there are different markers for the end of organisations where I’ve had to estimate the year. Short of an official dissolution, end dates can be hard to set for organisations, and often they may limp on long after any real activity, but if anyone has a more accurate guess for these, do let us know in the comments. As with the archive itself, the intention is for the timeline to be quite broadly inclusive. So, short of including lots of single issue campaigns, which I expect would make it unmanageable, any suggestions are very welcome. View the Timeline of the Irish Left here. Labour is heading for a “comfortable majority” at the UK general election as the Conservatives have lost a third of their support and are only attracting a small number of new voters, polling by former Conservative donor Lord Ashcroft has suggested. The wonderful Hatful of History Blog is running a Competition for a copy of “Against the Grain: The British Far Left from 1956” which may be of interest. To go direct to the Left Archive please click on this link. Many thanks to Jim Lane for donating two more issues of An Phoblacht – The Republic from Irish Revolutionary Forces. It is intended to have a complete set of this important document in the Archive. It is also important to note how useful this document is in tracing – from a critical perspective, changing attitudes within Republicanism and Sinn Féin and the IRA during the late 1960s. That it was positioned critically in relation to Sinn Féin and the IRA is of particular importance offering a distinctively different view into the changes in those organisations. As always it is probably most useful to quote briefly from both editions. Issue 11 has a reproduction of the text by John O’Leary of a piece on Self-Sacrifice, first published in the Irish People on December 19th, 1863. This is as it should be, and as it must be if Irish Republicanism is to retain that independence elf action essential to is success as a revolutionary movement. When organised Republicanism becomes the lackey of any external influence, it ceases right there and then to be IRISH, and it cannot justifiably claim the capability to serve the Irish People. No movement can serve two masters; it is as simple as that. Over the past few years, we have continually laboured to bring home to all Irish Republicans the hard fact that a foreign directed clique has worked its way into leadership circles, for the express purposes of directing the efforts of the Republican Movement along lines advantageous to the interests of a foreign power. The subversives are, as we have repeated pointed out, drawn primarily from the ranks of the British Communist Party and its Irish sections, which are in turn directed from Moscow. It suggests that ‘these foreign agents initially entered the movement through the influence of an IRA Headquarters officer’ and argues that while they thought initially he was sincere they now believe they have proof he was ‘recruited into that network which covers Britain and Ireland, and which is managed by the British Communist Party’. It also mentions ‘four-eyes’ Johnson of whom it argues it was no accident that ‘he should so easily enter the leadership circles of the Republican Movement’. And it continues that ‘Johnson, Coughlan and the rest of their clan were on the other side in ’56, but at least they were, for them, being reasonably honest then’. It argues that in contrast to the ‘self-styled Progressives’ in the Republican Movement ‘we are most assuredly committed to ‘trouble-making’ for all enemies of our traditional Republican aspirations and for all parasites and milk-and-water patriots who embrace Republicanism for the sole purpose of draining it of its fighting blood’. And it concludes by saying… ‘Unfettered freedom never came to a people gift-wrapped in a ballot box. It is only for those strong enough to take it, and determined enough to hold on to it. Our claim to Freedom and national sovereignty rests squarely on our ability to pursue them by the only means they ever have been won; BY ARMs’. Other articles in this edition include one taken from the Irish People of October 1, 1864 entitled Doubters and Shams. Another argues under the heading ‘A Source of Weakness’ that ‘It is a sad fact that over the past 50 years the weakest link in the Republican front has been Sinn Féin’. There is a piece on ‘Views on the Present Situation’ which argues that those dissatisfied with the direction of the then Republican Movement should not leave it. And it concludes by asserting that ‘If you desire victory, Arm, Organize, Educate’. 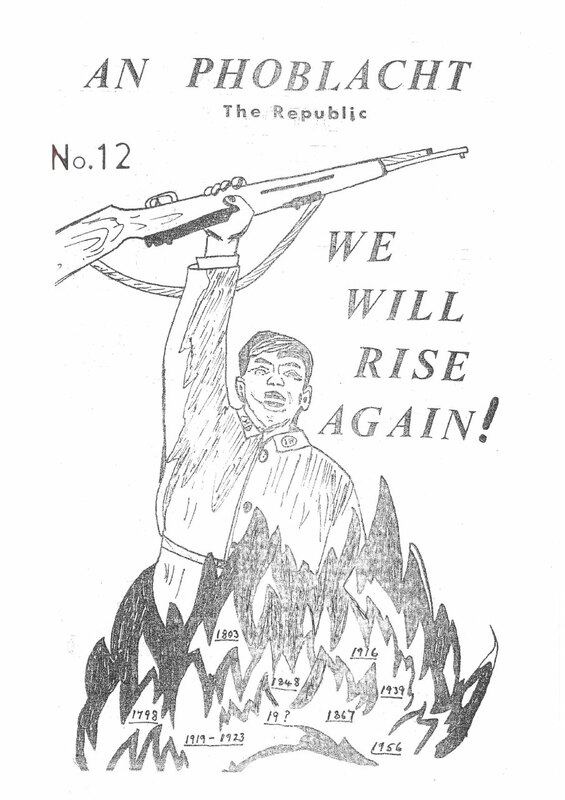 Issue 12 has a striking cover, an illustration of a soldier rising from the flames in which are inscribed dates such as 1798, 1803, 1848, 1916, 1939 and 1956 beside the headline ‘WE WILL RISE AGAIN!’. The editorial focuses on ‘The issue of the Free State’s entry into the European ‘Common Market’ [which] dominates the activities of the Republican Movement these days. It argues that ‘Many complicated, and at times contradictory arguments are being presented by the ‘Progressives’ to show why the Free States should not enter’. And it continues, ‘We notice that when the ‘Progressives’ deal with the Free State in this question, they talk of it as IRELAND! We notice they talk in terms of ‘our ministers’, and on the ‘relinquishing of national control’ which implies that we presently possess such control’. It argues that ‘We are not suggesting that entry into the ‘Common Market’ would be in the beset interests of the people. However, the real question for Irish revolutionaries is not the effects of such an alliance but its root cause. And this is a matter which gets little space in the laments penned by the scribes of the Wolfe Tone Society’. As a neo-colonial state subordinate to British Imperialism, the Free State has no option but to do what its economic masters dictate. It cannot enter, even if it desired, if Britain does not; and it must enter the ‘Common Market’ regardless of whether it wants to or not, if Britain does. To confuse and cloud this basic issue with talk about loss of sovereignty, is to play the games of the neo-colonialists; because it gives recognition to their claims of an independent politico-economic status, which they never possessed to begin with, and which Irish revolutionaries have never recognised, and rightly so. One only has to read the social, political and economic programmes of present-day Sinn Féin to see this clearly; to see that what they present is not a real alternative politico-economic system, but merely an alternative Free State party to manage the existing system, and which proposes to change that system only insofar as the fundamental interests of its ruling class allow. And it is for precisely this reason that the people in general reject them. The national colour may be green; but the people are not so green that they cannot appreciate that if we are to be stuck with the system represented by the Free State, it is far better to vote for the devil you know than the one you do not know. The editorial argues that only if State Power is contested and won will there be a possibility to ‘fundamentally alter… the adverse effects of neo-colonialism’. This edition also contains a piece on ‘Revolution and Force’, another on the issue of how on IRA Sweep Tickets an illustration of a volunteer ‘trampling defiantly on the British Imperialist Union Jack’ has been altered so that the flag ‘blends nicely into the background, and in fact disappears altogether’. There is a long piece on ‘The Road to Free-Statism’ which strongly criticises the Connolly Association, their paper the Irish Democrat and Desmond Greaves. There’s also an article which draws largely on the text of ‘Guerrilla Warfare: A Method’ by Ernesto Che Guevera. There’s also some wry observations on the then recent Local Elections which argues that ‘The results of the Local Elections amply demonstrate what we have said all along: the road to compromise offers no solution to the problems facing Irish Republicanism’.